As Black Friday & Cyber Monday is less than 2 weeks away and the holiday season slowly creeps up on us, we all started to look for special gifts. This year Black Friday is on 23rd of November, however, retailers like Banggood, GeekBuying and GearBes are already dropping their prices in preparation for the big day. If you do not know, Cyber Monday, is the first Monday after Black Friday and the whole weekend is the best time of the year for deals. Unfortunately, not all deals are good deals though. You should avoid deals that offer incredibly high price drops. You know, it is pretty unbelievable that some unknown retailer can offer a $1000 DJI Mavic for only $50. I saw many ads where they are using images and specs of the Mavic for selling a E58 (in best case), for example. Of course, some reputable stores can offer similar deals, but for a very limited quantity, which will cause many people to arrive early to that store in trying to be one of the lucky few to get one. If a new drone is on your wish list, you’re in luck, because Black Friday offers some of the best deals of the year. Personally, I wish to catch a Hubsan Zino. It seems to be the best drone with 4K under $500. The Eachine Tyro 99 DIY drone comes in parts, providing the fun to be assembled by yourself. The package includes the frame kit (including screws), flight controller, ESC, motors and FPV system (VTX, antenna & camera). In order to get it in the air you will additionally need a radio receiver, transmitter and flight battery. 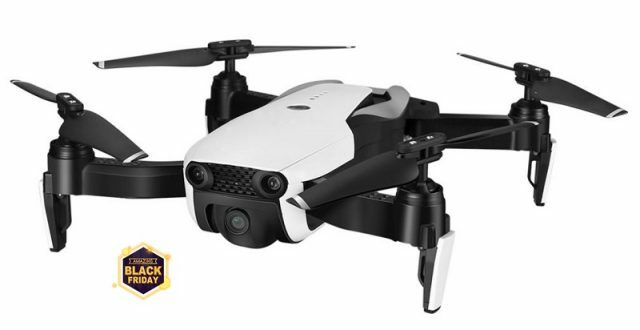 In addition to the cool Mavic alike foldable design, the TIANQU VISUO XS812 features GPS positioning system and altitude hold. Furthermore, thanks to the high capacity battery, it has up to 15 minutes flying time. While the FiMI A3 was just announced, it is already available for pre-order during the upcoming Black Friday Sale. The Xiaomi MI A3 is a GPS enabled drone with Full HD camera on a 2-axis gimbal. Its camera allows you to record aerial movies in 1920 x 1080 resolution at 30 fps. With the FiMI A3 drone you can also take pictures with 3264 x 2448 pixels. Compared to other similar drones, it features analogue 5.8G FPV instead of digital 5G WiFi FPV. The included remote controller has built-in FPV screen and DVR. Eachine made its entry-level E58 drone with two types of camera (0.3 and 2MP). Both, versions features WiFi real-time image transmission. This Mavic clone is compact and very portable, it has a altitude hold and headless flight mode. It easy to control even for completely newbie pilots. Flying time is about 7-9 minutes. Small portable drones like the Eachine E511 are becoming increasingly more popular. When its folded measures only 18.5 x 10.8 x 6.4cm, so you can take it with you everywhere. It is available with two type of WiFi FPV cameras: 2MP and 5MP. The nice Mavic Air design it is paired with lots of cool features. It has altitude hold, headless flight mode and multiple speed rates. The Wizard TS215, is Eachine’s latest and probably the most versatile FPV drone. 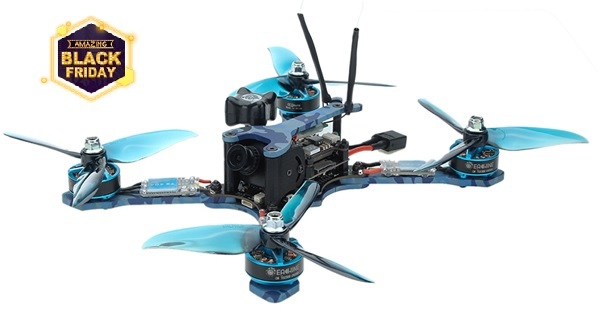 It features durable carbon fiber frame and versatile F4 flight controller. It uses some own brand TS2306 2450KV motors, which claims that can produce up to 2.3Kg of thrust. The on-board DVR allows to able to record the journey of your flights, without the need of a HD second camera. The 5.8G VTX features up to 800mW transmission power. It supports Smart Audio which lets you change channels and power levels remotely via your transmitter. Use coupon Promotion Period: 10 November 2018 – 23 November 2018. Use coupon Promotion Period: 10 November 2018 – 31 December 2018. Here, we will be constantly updating the best deals for drones, in the run up to Black Friday and beyond. If you, somehow, miss out the best Black Friday bargains, check back on Cyber Monday (November 26th) for more big savings! 11/30/2018 Added after Black Friday sales. Disclaimer: We can earn some revenue if you click the links and buy the products shown in this article. please could you add some Black Friday for drone under $100.